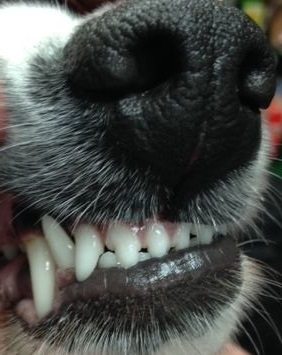 We discuss how to help keep your Dog and Cats teeth pearly white and healthy. Firstly, prevention is better than cure. Check the ingredients in your pets food and treats. Many big name brands contain ‘various sugars’ which are best avoided to help maintain good oral health. Regular cleaning and Vet checks are important. There are special toothbrushes and toothpaste available so that you can clean your pets teeth at home. Never use human toothpaste as it will make your pet sick. Your Vet will be able to give advice on how to brush your pets teeth properly and safely. Its clinically proven that chewing reduces plaque and tartar build up and there are loads of options available from Toys, Raw Bones (not cooked as they can splinter), Rawhide, Antlers, and Dental Chews. Toys – Cotton Rope toys, Rubber toys, and Nylon Bones are a great way of cleaning your pets teeth without adding to their daily calorie intake. Be sure to choose the right size for your pet. Raw Bones – Ideal for Cats because they don’t have the natural desire to chew. Chicken wings are probably the most appropriate and can be fed daily as part of your cats diet. Dogs love chewing raw bones but make sure you select ones that are appropriate for your dogs jaw size. Beef ribs and chicken wings are very popular among raw feeders. Rawhide – Good quality rawhide chews are a great natural treat. When chewed and softened they release collagen which dissolves plaque. Antlers – We only sell naturally shed antlers. These last for ages and stimulates a dogs need to chew. Many owners will give an antler to their dog for only a few minutes per day and reward them when they take it away. Soaking an antler in warm water can encourage your dog to chew it. Seaweed Powder – Simply sprinkle onto your pets food to help naturally soften plaque. Dental Chews – Choose good quality dental chews such as Gentle Bone or Whimzees. They contain natural ingredients, encourage chewing and last longer than most. Chewing releases happy hormones called endorphins into a dogs brain which help them relax. SmartBones – Amazingly these dental bones contain over 20% sugar. Dentastix – They have a controversial ingredient list including ‘Sodium Tripolyphosphate’ which is a known skin irritant. They also add ‘various sugars’ into some of their tinned food? Other dental chews – Many other dental chews contain sugars and derivatives and would not form part of a healthy diet. Thanks for taking the time to read and remember to always supervise you pet when chewing.